-Find a spot with good sun, at least 4-6 hours direct light. -Use any type of planter: pots, hanging baskets, raised beds, old tires, old tubs, etc. You don’t have to spend much money, just find a container that isn’t broken! -For soil, if you use native soil (i.e. whats in your yard), you will need to amend it. OR soil generally needs lime and an all purpose organic fertilizer blend. If you buy potting soil, don’t forget to buy fertilizer too, as most bagged soils don’t contain much, if any. -Seeds can be started in trays or small pots in a sunny window exposure, then transplanted for an early start. -In small spaces, it is a good idea to think vertically to maximize space. -Think about the size of the plant you want to grow at full maturity. Will it do well in confined situations? Some veges are just fine small, like lettuce. Broccoli on the other hand, will barely flower in confined spaces, and you won’t get a harvest. Tomatoes will adapt, and yield based on how much space they have. Also, do plants occur singly, or in groups? Corn for instance, won’t put on ears unless there are a minimum number of plants (around 40). -Vertical veges: pole beans, cucumber, tomatoes(especially when pruned), grapes, hardy kiwi, espaliered fruit trees, berries, winter squash/pumpkins, melons. -Compact veges: lettuce, chicories(endive, radicchio, frisse’), scallions/cippollini/spring onions, globe or baby carrot, radish, mache, spinach, bush bean (French filet especially), beets (tops are edible too! ), micro greens/pea shoots/sunflower sprouts. -Ornamental/Edibles: kale, chard, gourd, runner beans, top setting onions. -Much hardier than veges, most don’t need the same level of fertility. This means many herbs can occupy poor soil, weedy/marginal areas, and transitional/border areas. -Medicinals often attract beneficial insects and pollinators, which helps control pests and boosts yields, and generally keeps a garden in better shape. -Always good to have some cooking herbs on hand. 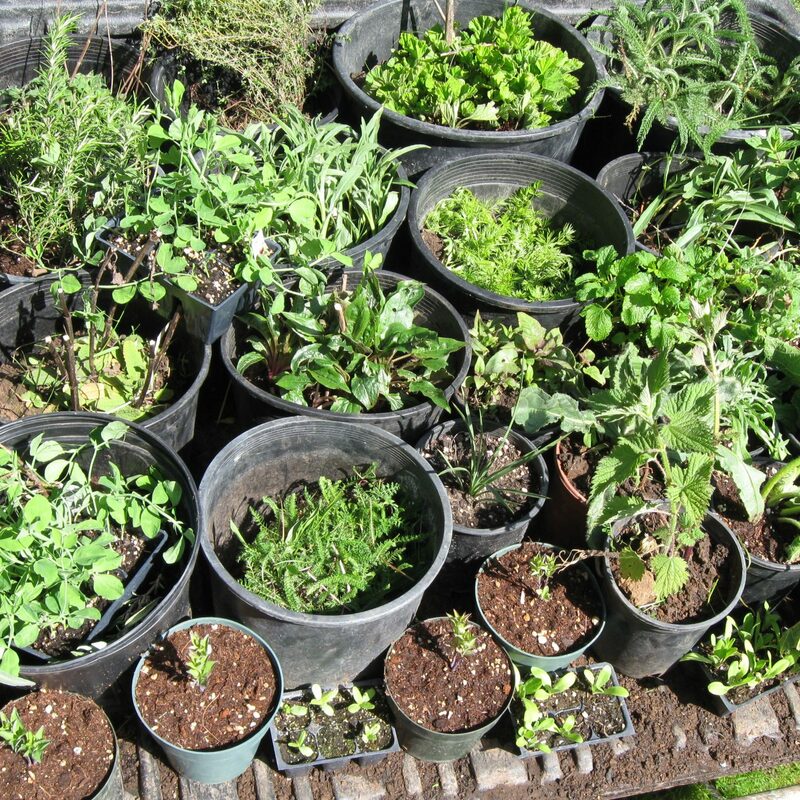 Cooking herbs will do better in fertile soils, but can grow without. They like some drainage (add sand), since they tend to be mediterranean. Many cooking herbs are also medicinal. The most important cooking medicinal are basil and thyme (colds), rosemary (general tonic, circulation), sage (congestion, women’s issues), mint (flu/fever, stomach upset), and oregano (anti-biotic). -Some medicinal are perennial or self seeding, which can save the gardener work for future seasons. -Cooking herbs that are medicinal: basil, mint, oregano, rosemary, sage, thyme, chives. -Annuals: calendula (oil infusions), chamomile, spilanthes (teeth and infection), cleavers (lymph, green food), california poppy (pain relief). -Ornamental perennials: Echinacea/coneflower, monarda/bee balm (aromatic 4 stomach upset), balloon flower (lung infections), anise hyssop, Oregon grape root (anti-biotic). -Vertical herbs: wild yam, bitter melon, passion flower, codonopsis. 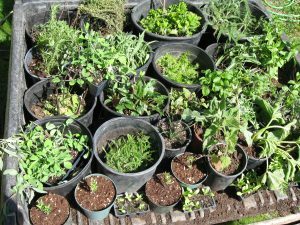 -Tough/Marginal area herbs(all perennials/biennials): yarrow, astragalus, licorice, nettle, mints/lemon balm, mullein, comfrey.